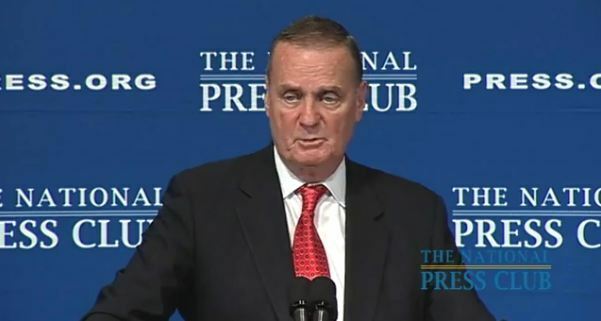 Former U.S. National Security Advisor James L. Jones called for the United States to create an aid package for Egypt similar to the Marshall Plan that helped Europe emerge from the destruction of World War II at a National Press Club luncheon May 16. The plan would provide economic and governmental assistance and send a clear message to those who have doubted U.S. intentions in the region. "When we look at strategically important countries, Egypt commands a unique regional position, and it is extremely important that Egypt not turn out the way Iran did 30 years ago," Jones told a ballroom audience. The opportunity for significant democratic change is possible, he suggested, especially since the Egyptian army has shown itself able to gain the trust of Egyptians in advance of the country's September elections. "What recent (Middle Eastern and North African) events have in common is the awakening of an entire generation of young people who have come to the realization that absent major reforms, the way their current governments view their future and that of their children holds little promise for them," Jones said. Whatever the source of this new awakening, it is powerful enough to change the course of history and to do so extremely rapidly, according to Jones. Those who thought that the Iraq and Afghanistan wars were representative of how 21st Century conflicts would unfold were wrong, he said. "The rapidly changing strategic landscape, especially in the last few months, tells us that it is very difficult to predict the future," Jones said, underscoring how crucial it is to accurately assess the strategic implications of recent events. The world is definitely safer today after the death of Osama bin Laden, Jones said. He said that Pakistan, Bin Laden and Afghanistan are inextricably linked and will affect outcomes in the entire region. "Bin Laden's fate and the fate of the majority of the Al-Qaeda leadership over the past few years should serve as a fair warning to those who would lead such groups in the future," Jones said. One of the security benefits of engaging in the conflict in Afghanistan and opposing terror-driven plots has been the international cohesion it has produced among intelligence operations, according to Jones. Sharing intelligence assets has become increasingly important for countries being threatened by terrorists. The cooperation has led to earlier detection and the foiling of some attacks. Jones served as President Obama's first national security advisor. A retired four-star Marine general, he held the posts of Supreme Allied Commander in Europe and Commandant of the Marine Corps. Retiring after more than 40 years in uniform, Jones now heads his own national security and energy consultancy.